Hi! I’m J and this will be my very first post. Unlike our big boss, I am a beginner in learning Nihongo. My knowledge of the language is almost next to nil even after being a fan of Japanese animes for YEARS. Yes I am able to pick up a few words from just watching, but let’s face it, it’s just that, words. Words that I don’t even know what the correct spellings were until Coolohoh made me learn Hiragana and Katakana. I guess she got fed up with reading my misspelled Arashi lyrics XD. Anyway, I want to share some Kanji I’ve picked up and learned from timing and typesetting. 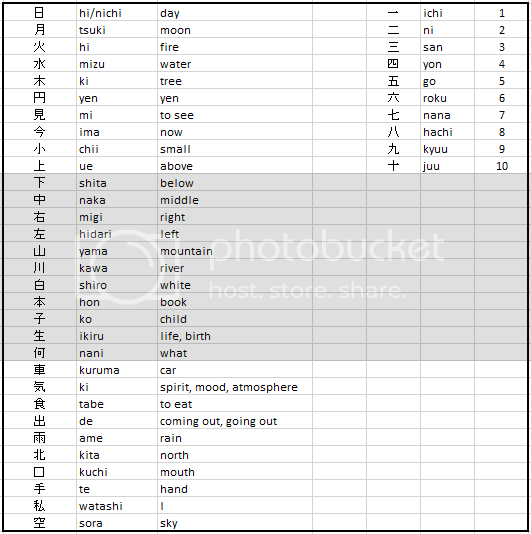 These characters are included in the JLPT N5 list, so it’s a must for beginners like me. Blog: It’s catch up time! Yay you J! You made your first post! HAHA! There you are! I was looking for you!